"A nice boutique country house set in stunning grounds. The house and gardens provide a great backdrop for any celebration especially weddings. The food is great, the staff are wonderful and the building is really pretty and full of charm." All reviews are the subjective opinions of third parties and not of the website or its owners. Reviews are placed by members of the public that have held a function or event at Langdon Court Hotel. 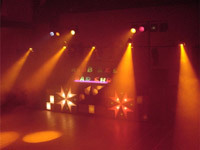 At needadisco.com we only accept reviews from confirmed clients that have booked a DJ to play at Langdon Court Hotel via our website, with the arrangements independently verified by both the DJ and the client before the event takes place - no "fake reviews" here! "Make sure you are very clear and that they have understood your requirements. Unfortunately the wedding co-ordinator left just before our wedding which we were not told about. Communication wasn't great and they had notes which didn't match what we had discussed. Housekeeping could also do with a check - rooms are clean where you can see but incredibly dusty behind curtains and bed rails. The food was good (as always). The service staff were attentive and polie but they do change fairly frequently. That said everyone at our party had a fabulous time in a fabulous setting." 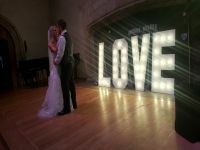 "Langdon court was the most idyllic place to have our wedding reception. The food was amazing^ and location brilliant. We stayed the night before but didnt have anyone meet us that evening and was left to set up the room alone. Although the rooms are lovely looking and large; we had a dirty towel and in the king suite there isnt a plug near where the kettle is. Our wedding day was perfect however." Helpful information for DJs and entertainers visiting Langdon Court Hotel provided by trusted members of needadisco.com. ACCESS: You need to park at the far side of the hotel - drive all around the front and through an entrance on the far side. Access to the function room is via two doors. Information is based on enquiries and bookings handled via needadisco.com so whilst it's a great insight, if you have any questions or concerns about holding a function or event at Langdon Court Hotel please contact the venue. Langdon Court Hotel has previously been hired as a venue for private parties such as birthday celebrations, anniversaries, engagements etc. Langdon Court Hotel has previously been hired as a venue for corporate events such as works parties, product launches, prizegivings etc. Langdon Court Hotel is in our Hotels category. The map below shows other local venues in the same category. 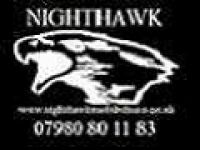 Get FREE no-obligation disco quotes from DJ Boombastic-Piedpippasoundsz and other DJs covering your venue. Take 2 minutes to fill in some basic details and we'll do the rest!